We have a situation, Brasil! 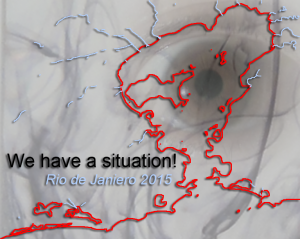 Following on from the 2013 project We have a situation!, Helen Varley Jamieson will travel to Brasil in October to create a “situation” in Rio de Janeiro, on the topic of water pollution. It is part of Multicidade, an international festival of women in the performing arts. live link to the stage https://upstage.org.nz:8083/stages/whasbrasil for performance. The “situation” will investigate water pollution in Guanabara Bay, in the context of the 2016 Olympic Games to be held in Rio de Janeiro. Many water sports such as windsurfing, sailing, rowing and swimming are planned to take place in the bay – where 70% of the city’s sewage is discharged, untreated, amongst other contaminants and pollution. City officials promised to clean up the water, but there has been very little action so far. We have a situation, and it’s in the water! You can follow the research and development of this situation here, and read the media release. The format of We have a situation! is a cyberformance, collaboratively devised and presented by local workshop participants, followed by an online discussion about the topic connecting people in the local venue, online, and in selected other places around the world. It was for We have a situation! in 2013 that Martin Eisenbarth developed UpStage’s audio-visual streaming functionality. UpStage will again be the platform used for We have a situation, Brasil! 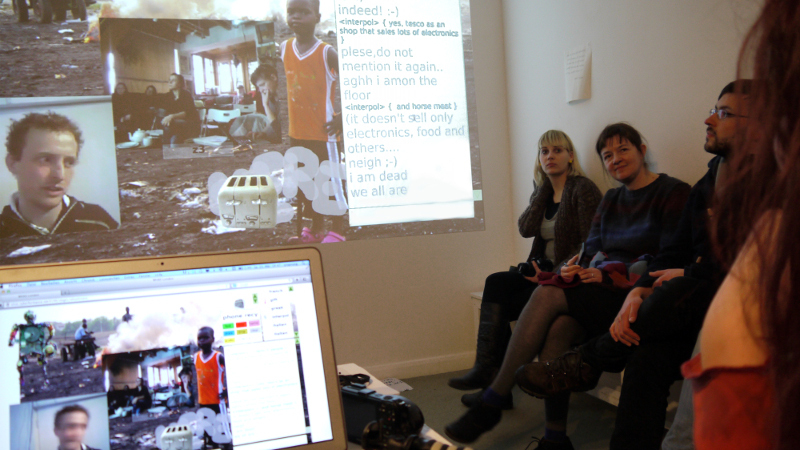 “We have a situation” at Furtherfield, London (February 2013) on the topic of e-waste.